She offered ECSTASY and DEATH! There's an African legend, that a long time ago, a ship was caught in a severe storm and was capsizing. The Captain ordered the women to board the lifeboats and to abandon ship, and ordered the men to stay on board, they went down with the ship. The women made it to shore and become known as the legendary tribe of white women, the Amazons. Jean Preston (Patricia Morison) leads a search expedition into the Jungle to look for her Fiance, Greg Jones (Bruce Edwards) who has not been heard from since he went on Safari in search of Ivory. Gary Lambert (Robert Lowery), who guides the expedition has been recruited as a government agent to stop an Ivory smuggling ring. Someone is trying to thwart their efforts and a few men are murdered. 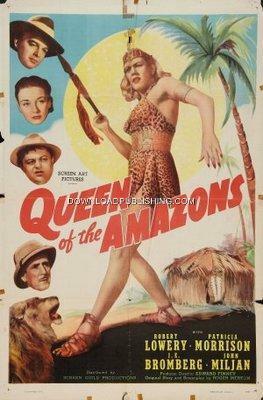 Jean finds her Fiance Gary, but also finds out she has to contend with the Queen of the Amazons to get him back. Production Company: Screen Art Pictures Corp.